This Keto Ground Pork Meatballs recipe is a delicious combination of pork, cheddar cheese and mustard baked in the oven. 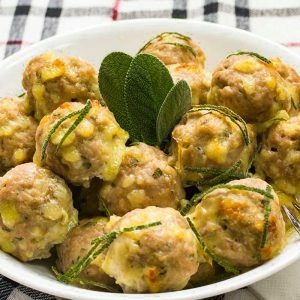 It sounds crazy, but the ingredients compliment each other nicely resulting in a juicy flavorsome low-carb pork meatballs dish. I found the baked meatballs recipe hidden in one of my old cookbooks, which I used to write my recipes in alphabetical order. When I started keto, it wasn’t hard to make the ground pork meatballs recipe as it’s close to the normal recipe but minus the breading to keep them low carb (the cheese and egg holds them together). The addition of cheese & dijon mustard makes the meatballs fattier to keep the meatballs keto friendly. This keto ground pork meatball recipe makes 8 serves. In a large mixing bowl place all ingredients. Mix well. We recommend donning a pair of food safe gloves and mixing by hand. Roll the meat into balls that are the size of 2 tablespoons. We managed to get 30 balls from this mixture. Place the meatballs onto a lined roasting tray. Bake in the oven for 20-25 minutes, until golden. Place a large non-stick frying pan over high heat. Add 1 tablespoon of olive oil and allow to heat up. Fry the meatballs in batches for approximately 15-20 minutes, turning every so often. Serve the meatballs and enjoy. Keto Ground Pork Meatballs Recipe - "Mustard & Cheddar" - Bake or Fry! A delicious Baked (or Fried) Ground Pork Meatball recipe. They're low carb, keto, paleo & gluten-free. The addition of cheese and dijon mustard adds to the fat content to make them "Very Keto". To make a larger batch of this baked meatballs recipe adjust the servings above. Maltodextrin What Are The Dangers & Where Is It Added?